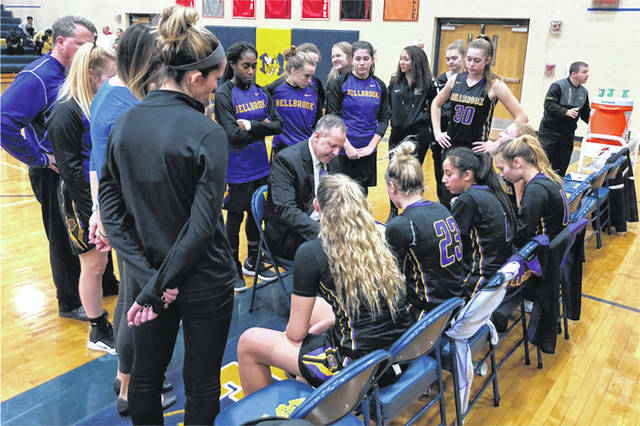 Scott Halasz | Greene County News Bellbrook High School girls basketball coach Jason Tincher draws up a play during a timeout Feb. 2 at Monroe High School. The Golden Eagles won, 46-34, behind 21 points from sophomore Bailey Zerby. MONROE — Jason Tincher has been trying to instill more confidence in sophomore shooter Bailey Zerby. “We’ve had many conversations,” the Bellbrook High School girls basketball coach said. The move-in from Wilmington made four three-pointers during a momentum seizing run in the first half and had a game-high 21 points to lead Bellbrook to a 46-34 win over Monroe Feb. 2 in a game that wasn’t as close as the final score may indicate. Zerby — who made more than two three-pointers one other time this season — sparked a 7-0 run in the final 1:06 of the first quarter to give the Golden Eagles a 14-7 lead, and then she hit three more in the first four minutes of the second quarter to give Bellbrook a 23-10 lead. As a non-starter, Zerby’s 12 first-half points were just one less than Monroe’s total as Bellbrook led 23-12 at halftime. Until she checked in, neither team led by more than two points. “I was coming off the bench, it gave me the opportunity (to spark the Golden Eagles),” Zerby said. Credit the Bellbrook defense too. After a sluggish start, the Golden Eagles (11-9 overall, 8-3 Southwestern Buckeye League Southwestern Division) kicked the defense up a notch and forced a handful of turnovers late in the first quarter to help ignite the offense. And hit a few three-pointers. Maria Mescher and Maren Freudenschuss each hit three-pointers in the early third quarter to give Bellbrook a 29-17 lead with 4:59 left. Monroe (10-7, 5-5) cut it to 30-21 late in the first but Zerby hit a pull-up three with 57 seconds left to make it a 33-21 game after three quarters. Mescher, Freudenschuss and Zerby scored six straight to start the fourth to make it a 39-21 lead with 4:32 left. Zerby’s bucket was ESPN worthy as she corralled a ball jabbed away by Freudenschuss and made a layup after a 360-degree spin in the lane. “I’ve been working on that for a pretty long time,” Zerby said. Monroe’s Katie Sloneker hit a couple late three-pointers and twin sister Sophie a three-pointer to make it a closer score. Sophie finished with 12 and Katie 10 to lead Monroe. Freudenschuss scored 10 and Mescher nine for Bellbrook, which has won won five in a row and seven of eight. The Golden Eagles are at Carlisle 7:15 p.m. Thursday Feb. 7 and visit Badin 1:30 p.m. Saturday, Feb. 9 before closing the season with Eaton 7:15 p.m. Monday, Feb. 11.
https://www.xeniagazette.com/wp-content/uploads/sites/32/2019/02/web1_Bellbrook-Time-Out_ne201922203144638.jpgScott Halasz | Greene County News Bellbrook High School girls basketball coach Jason Tincher draws up a play during a timeout Feb. 2 at Monroe High School. The Golden Eagles won, 46-34, behind 21 points from sophomore Bailey Zerby. Contact Scott Halasz at 937-502.4507.